Got a pile of cash to blow? It's huge, makes gaming an absolute joy and multi-tasking magnificent. Shiny! Spring is on the way, but it's still a mite chilly in the office. Thankfully, we're sitting here writing this review on a beast of a monitor that's radiating enough heat to give us a tan. And it's beautiful. Sure, it takes a little while to get used to scouting the length and breadth of the viewing area to find icons, but who cares? The display is crisp and the colours are clear and vibrant. Plus, it's a peach for gaming. The response time is fairly decent, though not the fastest, but there's no obvious ghosting or unintentional motion blurring. Amazingly, it manages to make the latest Dell 30-incher look a little washed out. Oh yes. We had a quick Quake deathmatch on both displays, swapped screens halfway through and found that while the HP panel is generally darker, the colours are far deeper and richer. It's around £200 more expensive than the Dell and feels a lot chunkier, but when you're spending this much on a monitor what's a double ton between friends? 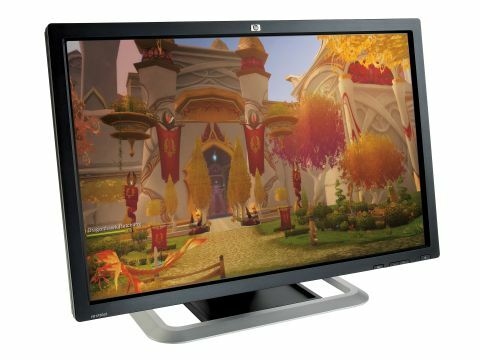 You're limited to input and brightness controls on the monitor itself, but with the off- puttingly vast array of display options both in-game and in your graphics card drivers, that's no problem when you're easily dwarfed by a flat screen of this size.